One day at The Alto Nido Apartments in Hollywood, my friend and I sat at home and got bored quite early in the morning. My Housemate and close friend Christian Bjorn suggested that we head out to a popular restaurant in the Hollywood area called 'Solar de Cahuenga.' I personally think they have some of the best food in town. Anyway, we got to the restaurant, we had to find a place to sit. We started off sitting inside until we decided that we wanted to sit outside, where the was fresh air. What was supposed to be a table search ended up being a moment when my friend Christian and I decided to stand by the road side, outside the Solar de Cahuenga. There was something special about watching the cars approach and leave, as we looked at different characters in their vehicles, big and small. While we were in deep conversation, I noticed a BMW, white in color. My attention quickly drifted because, the lady in the passenger seat looked familiar. At first, I thought it was someone I knew from around the way. To my surprise, it was Eva Longoria. She's definitely not the person I was expecting to meet that day. Having seen Eva and this man drive past, I told my friend who it was. Christian was not too sure and, he couldn't believe it. As I looked ahead at the traffic lights, it seemed like Eva and her companion were looking for parking space other than was available at the restaurant. I came to realize that they probably didn't want to be seen by so many people. I went to the back of the restaurant and surely found the BMW parked in the street. By the time I got to the car, the two had already found their way to the back area of the restaurant. They both stood inside the restaurant for a few seconds as they looked around but quickly walked out to the back area. 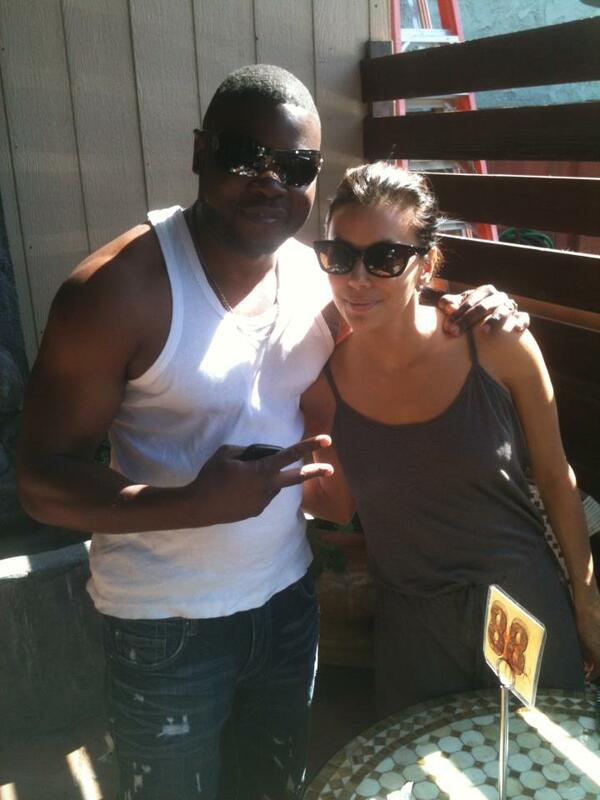 By this time, I was 100% sure that the lady I had just seen was in fact, Eva Longoria! I asked my friend to grab his iPhone because I wanted to meet and take a picture with her. I approached the table they were sitting on and I said, "Excuse me? Eva Longoria?" She replied "Yes" while sitting down in a grey dress, hair tied, a pair of black sunglasses and she looked up to me with a pleasant smile as I stood next to her. I then excused myself from the man that was at the table with her. He didn't mind and he seemed understanding. I'm assuming it was not the first time this ever happened in front of him. I introduced myself to Eva. I told her that I was an International Hip-Hop artist from Lusaka, Zambia in Africa. I said to her that, I was a big fan and expressed my sadness over her divorce to Tony Parker. I told her that I watched her host the Europe MTV awards and also said to her that I think she deserved it because it was something to keep her mind off that situation. I told her that I could see that it hurt her and, understood. She agreed with me as I spoke. We quickly took two pictures, one of which ended up on my Facebook Fan Page . While I'm from Africa, I never get star struck when I meet celebrities. In my country, most people consider me as a celebrity but, I have not really embraced this title. I just say that, I posses a skill and talent that is rare. After meeting her, I can only say that, Eva is a lady with a personality that compliments her beauty." Hi! My name is Catherine Hough. I work for E! Entertainment. We are producing a new show airing this fall that highlights fan and celebrity interactions. We would love to use your photo and story. If you are interested please email me at Catherine.Hough@nbcuni.com, Thank you!